Note: The below is all just for fun. But it does make me realize that there are probably going to be some indie developers, in particular, that might want to just use WM to make all the textures for their terrain, period. It’s pretty sweet looking, actually, which is totally unexpected. 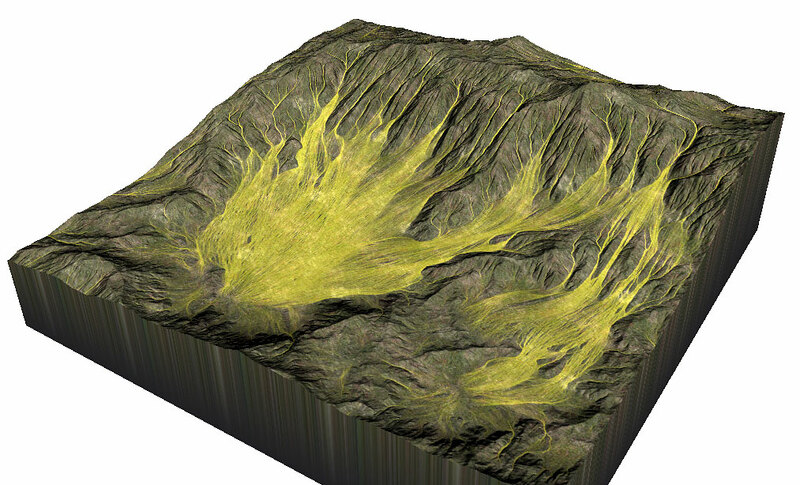 The network to produce the image above is just a basic eroded perlin, overlayed with an RGB network. The net consists of an imported rough texture tiled across worldspace,Â with color adjustments made according to the erosional masks. With the major features of tiling and layout mode beginning to undergo testing, I’m turning now to a couple areas that haven’t recieved much attention. The File Input device is getting a bit of a makeover, so that it operates more similarily to the tiled file input device. It now also supports RGB input (although only through the TGA and BMP formats so far; eventually more will come). Although I certainly have no plans to turn WM into a general purpose image manipulation program, the fact is that WM supports HDR RGB data and I/O, a simple interface, and a freely available plugin kit; it would be pretty easy to make a set of devices to allow you to use WM as a high-dynamic-range image adjustment toolkit. I view this fact as very cool; the WM paradigm applied to more than just terrain as it were. More to the point, what this brings to my mind is something I want to do for Pro, which is to allow some devices to operate on heightfields or bitmaps (or anything) that does NOT correspond to the general world that has been strongly defined by WM. In other words. When you import a bitmap image that is 653×542 pixels, you can certainly map it into worldspace and deal with it there.. but you should ALSO be able to take that image and treat it as an isolated piece of data; make no attempt to rescale it to fit the world size specified, etc. Why would you possibly want this? I can think of several different reasons to do this. Let’s say you have an artist who has sculpted a couple really nice looking shapes. We could use this ability and the new “placement” device to load in that shape, and then scatter it into world space randomly. Or plenty of other things. I’m not precisely sure how I want things to work along this line; it’s uncharted terrain for WM yet again so I have to feel my way and see what seems right or wrong about implementing it. We’ll see if it makes the actual WM Pro. Rhalph reminded me to post about the fact that the first alpha version of Pro has just made it out to the alpha testing group. This is the first in a (long) set of milestones before release. There will be numerous alpha milestones before the beta test begins with a larger group of users.